Nitrogen oxides (from fuel combustion) and ammonia (from the agricultural sector) contribute to acid deposition and nitrogen enrichment of vegetation, soil and water. Nitrogen oxides are also a precursor for the formation of ozone. While nitrogen can have beneficial fertilising effects on vegetation, an excess of nitrogen can lead to eutrophication in water bodies, threaten soil and water quality, and negatively affect terrestrial biodiversity. In 2005/6, nitrogen concentrations were determined for the first time at the European scale in naturally growing mosses sampled every five years (originally as biomonitors of heavy metal deposition; see Heavy Metals). 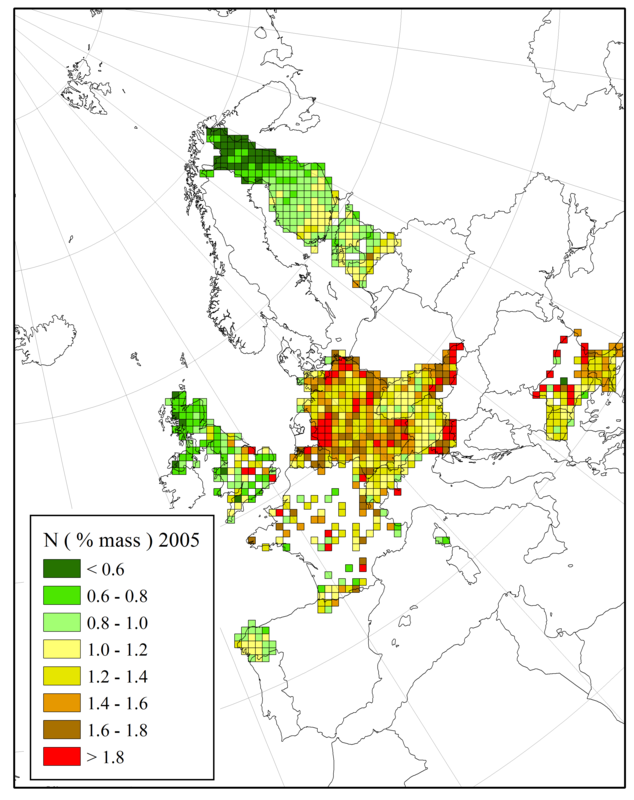 The lowest nitrogen concentrations in mosses were observed in northern Finland and northern parts of the UK, the highest concentrations in Central and Eastern Europe. The spatial distribution of total the nitrogen concentration in mosses was similar to that of the nitrogen deposition modelled by EMEP, except that the nitrogen deposition tended to be relatively lower in Eastern Europe. An asymptotic relationship between EMEP-modelled nitrogen deposition and nitrogen concentration in mosses was found, with saturation of the concentration in mosses occurring at deposition rates between 15 and 20 kg N ha-1 y-1 (Harmens et al., 2011).The relationship was stronger when based on site-specific measurements of nitrogen deposition (Harmens et al., 2014). In countries with a nitrogen deposition rate below 20 kg N ha-1 y-1 (such as Scandinavian countries and Switzerland), there is a linear relationship between nitrogen deposition rates and nitrogen concentrations in mosses. Hence, the moss technique is a valuable tool to identify areas at risk of high nitrogen deposition at a high spatial resolution in a cost-effective manner. It is complementary tool for estimating nitrogen deposition in low to medium nitrogen deposition areas. The nitrogen concentration in mosses provides an early warning for areas at risk of high atmospheric nitrogen load and subsequent impacts on terrestrial ecosystems. Further details are available in Data and Maps. Mean total nitrogen concentration in mosses per 50 x 50 km2 EMEP grid square in 2005 (left) and 2010 (right). The most recent moss survey was conducted in 2015/16 and coordinated by the Moss Survey Coordination Centre at JINR, Dubna, Russian Federation. The report is expected to be published early 2019. The critical load for nitrogen is the highest nitrogen deposition load that will not cause changes leading to long-term harmful effects on ecosystem structure, function and biodiversity. Exceedance of the critical load is a measure of the potential risk of harmful effects occurring in the long-term. Based on experimental evidence of harmful effects of nitrogen on vegetation, empirical critical loads have been defined for various habitats. The latest update of empirical critical loads were agreed at a workshop in 2010 in the Netherlands. In addition, critical levels for ammonia and nitrogen oxides are defined in Chapter 3 of the Modelling and Mapping Manual of the LRTAP Convention. ICP Vegetation has contributed to the discussions and development of critical loads (for nitrogen) and levels (for ammonia and nitrogen oxides) for vegetation, particularly with data collated by participants from nitrogen exposure experiments. The ICP Vegetation encourages participants to continue to contribute data to the further development of critical levels and empirical critical loads in preparation for any future reviews. Lichens and mosses contain species that are among the most sensitive to elevated atmospheric nitrogen deposition. Therefore, critical levels of ammonia have been set at a lower concentration (1 μg m-3) for lichens and mosses (and ecosystems where lichens and mosses are a key part of ecosystem integrity) than for higher plants (3 μg m-3). Sensitive habitats with low empirical critical loads for nitrogen include raised and blanket bogs, nutrient poor mires, tundras, Racomitrium containing wet heathlands, and arctic, alpine and sub-alpine scrub habitats. Despite conservation efforts, many lowland heaths in Western Europe have become dominated by grass species over the past 20-50 years. For boreal forest, it has been recommended to reduce the empirical critical load to 5-10 kg N ha–1 y–1. The loss or decline in abundance of species with a high retention efficiency (so called nitrogen ‘filters’) such as mosses and lichens results in an increase in the amount of inorganic nitrogen available to higher plants and soil microbes. Elevated nitrogen availability favours faster growing, more nitrogen-loving species, leading to competitive exclusion of plants adopted to low nitrogen availability, ultimately resulting in a decrease in plant diversity. High nitrogen concentrations in soils might lead to leaching of nitrogen to ground and surface waters. Recovery from nitrogen enrichment can be a very slow process. 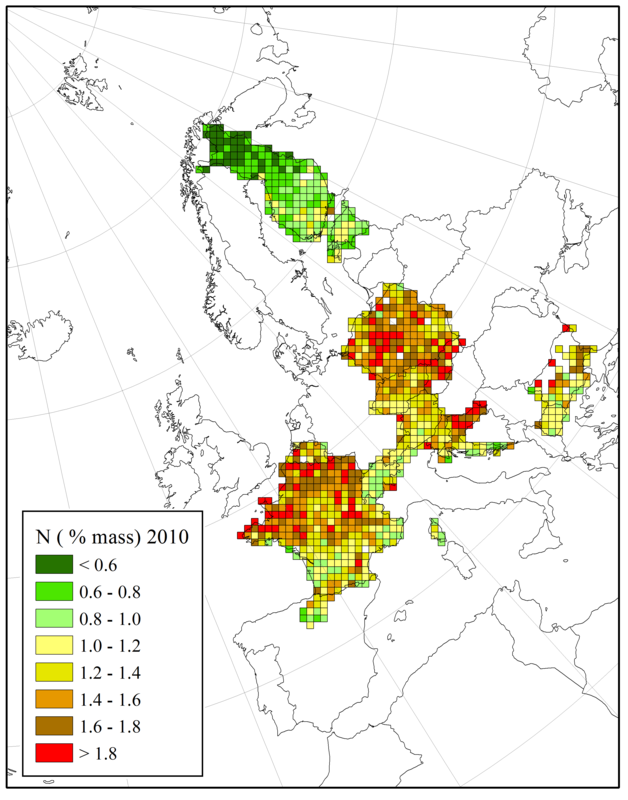 The lowest nitrogen concentrations in mosses are found in Northern Europe, the highest concentrations in Central and Eastern Europe.